Peter Alan Laird (born January 27, 1954) is an American comic book writer and artist. He is best known for co-creating Teenage Mutant Ninja Turtles with writer and artist Kevin Eastman. 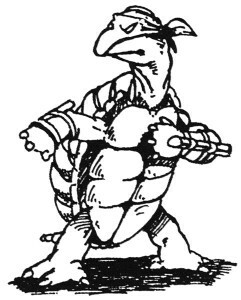 In May 1984, Laird and Kevin Eastman self-published the first black & white issue of Teenage Mutant Ninja Turtles, at an initial print run of 3000 copies for the forty-page oversized comic. 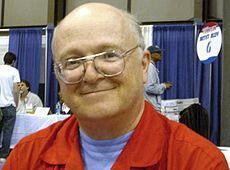 It was largely funded by a loan from Eastman’s uncle, Quentin (which experience had a profund impact on Laird, and led indirectly to his later work with the Xeric Foundation), and published by the duos Mirage Studios, a name chosen because “there wasn’t an actual studio, only kitchen tables and couches with lap boards.” That first issue received a number of subsequent printings over the next few years, as the Turtles phenomenon began to take off. On October 19, 2009, Laird sold the franchise to Viacom/Nickelodeon, but still retains the rights to do up 18 black-and-white TMNT comics per year.